Watch our session on the Post-EU Era from the Annual Meeting 2017 here . Europeans are most concerned about immigration and terrorism at a continental level, according to the latest Eurobarometer survey (download). 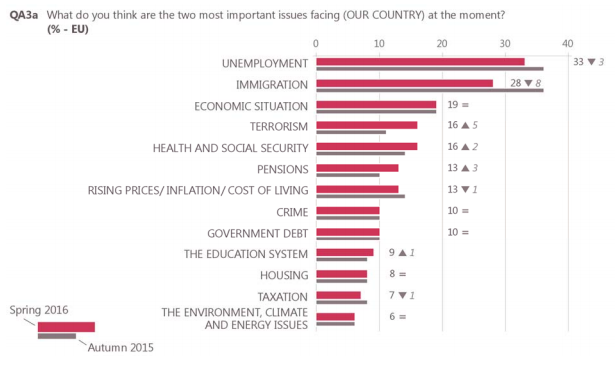 But, at a country level, Europeans have a different concern at the top of their list: unemployment. The latest survey, conducted in May, sees the first fall in mentions of immigration in nearly three years. Terrorism sees a fourth successive increase. 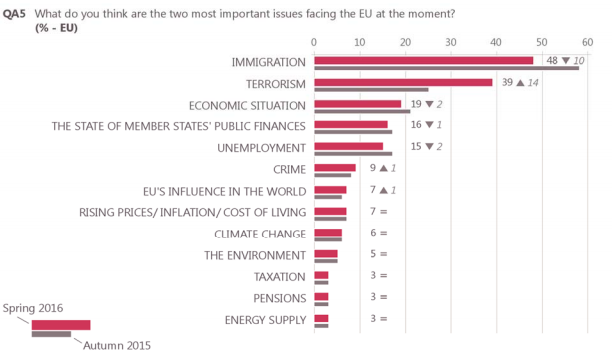 Despite a fall of 10 percentage points, Europeans still see immigration as the most important issue facing the EU. The survey found that 67% of Europeans support a ‘common European policy on migration’. Terrorism has risen steeply as a concern. The current survey was first conducted after November 2015’s attacks in Paris, and March 2016’s attacks in Brussels. The economic situation remains in the top three, though the percentage of people mentioning it has declined significantly since 2011. Back then, nearly three in five Europeans named it in their top two. A similar picture emerges at the national level, although unemployment jumps to the top. A third of Europeans see it as one of the two most important issues facing their country. Unemployment took first place in 11 countries. Spain leads the way, with 71%, followed by Cyprus (67%) and Portugal (62%). Immigration came first in nine EU member states. Interestingly, though, the free movement of people, goods and services within the EU was seen as the most positive result of the union. 56% of Europeans named it as the most positive – an increase of one percentage point. The survey also looks at trust in national governments and parliaments. The results indicate a clear lack of trust in institutions. While a third of Europeans trust the EU, just 28% and 27% trust their national parliaments and governments, respectively. 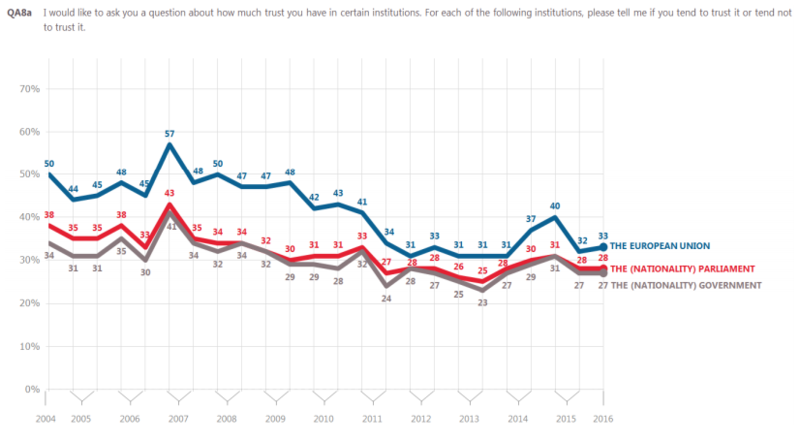 As the chart highlights, there has been a decline in trust over the past 12 years. Trust in the EU peaked at 57% in 2007, with trust at a national level also at its highest in the same year.